Bruce D. R. Grant’s good friends David and Zhanna Higham have boys whose escapades have been in many cases, so funny. Their antics inspires Grant to write short bedtime stories for children between the ages of 1 and 8 years old. 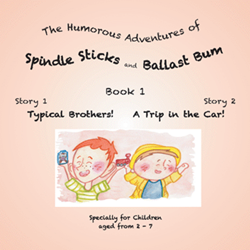 The first of which is “The Humorous Adventures of Spindle Sticks and Ballast Bum - Book 1 Story 1: Typical Brothers! and Story 2: A Trip in the Car!” (published by Partridge Singapore). These short bedtime stories are designed to be read out loud to the young ones, with explanations of what Spindle Sticks and Ballast Bum are doing on each page, with the reader asking questions of the listener. To help the story-teller and also the young listener to better understand the 'bold' typed words, there is a short thesaurus or dictionary at the lower left of each page, offering alternative words to those used. Bruce D. R. Grant has had an extraordinary life so far, including boarding school in Yorkshire, during the 50s, agriculture at Marshall College, Aberdeen University, Aberdeen, Scotland and the School of Hard Knocks, embracing a wide variety of experiences caused by a broad spectrum of jobs, professions, inventions and projects. He has been involved with theatre since the age of 11. Since then, his experiences have strengthened his vocal abilities, voice control and helped hone his natural acting talents, which have augmented his marketing and selling skills used successfully throughout his life. He has a musical ear and was also a professional harmonica player for two years. Grant has been a story teller or recounter/narrator for many years and has a very inquisitive mind, directing him to always search for and seek out new ways of doing things, hence his inventions. Since a spinal injury, early in the 90s in Russia, curtailed his professional employment, Grant has written a couple of books, numerous short stories, lectures and lastly, a series of 20 bedtime stories for very young children, named Spindle Sticks and Ballast Bum, who have many humorous adventures in their very young lives. His book and lectures have been used in a number of Russian state schools and private English Language schools. He enjoys life with his Russian wife in Moscow.